The islands of Hawaii are known for it crystal clear waters, postcard perfect beaches, and romantic sunsets. Honeymoon in Waikiki and you'll find all of that, plus the exciting nightlife and amazing restaurants you'd expect from any major city. 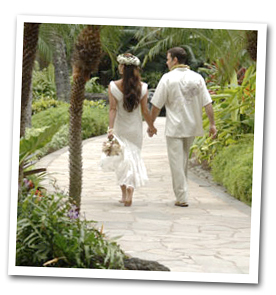 Plan your perfect romantic tropical getaway! Get ideas on how to make your romantic rendezvous extra special. Enjoy oceanfront fine dining and taste the flavors of Aloha. Experience fashionable wine bars, trendy bistros and thriving arts and culture scene. Spend time shopping for clothes, art, and jewelry at the newly renovated Waikiki Beach Walk and Royal Hawaiian Center. Grab your sweetheart and explore the beauty of the island's outdoors. Stroll hand by hand on white sandy shores...holding hands at sunset... or simply celebrate each other with an intimate couple's massage. Make this vacation her dream come true. Hike through rainforests to kiss under hidden waterfalls and kayak with sea turtles. Take a hike to the top of Diamond Head Crater and learn to surf or simply do nothing at all but enjoy each other...in paradise. After 100 years in this prime Waikiki beachfront spot, the Halekulani has grown to 455 rooms—but it still manages to feel like the most intimate, peaceful hotel on the island. In the heart of Waikiki Beach, the Moana Surfrider, A Westin Resort, introduced the world to Hawaiian hospitality in 1901. Often referred to as the “First lady of Waikiki”, this oceanfront Oahu hotel is a legendary landmark. Hilton Hawaiian Village® Beach Resort & Spa is Waikiki's only true resort destination, offering the perfect mix of exceptional resort accommodations and classic Hawaiian hospitality, all nestled on 22 beachfront acres. Centrally located on World famous Waikiki Beach. Rising on a half-mile of crisp white sand, the Sheraton Waikiki Beach Resort casts sparks with an endless whirl of entertainment. Have a question? E-mail us and we'll do our best to answer you.